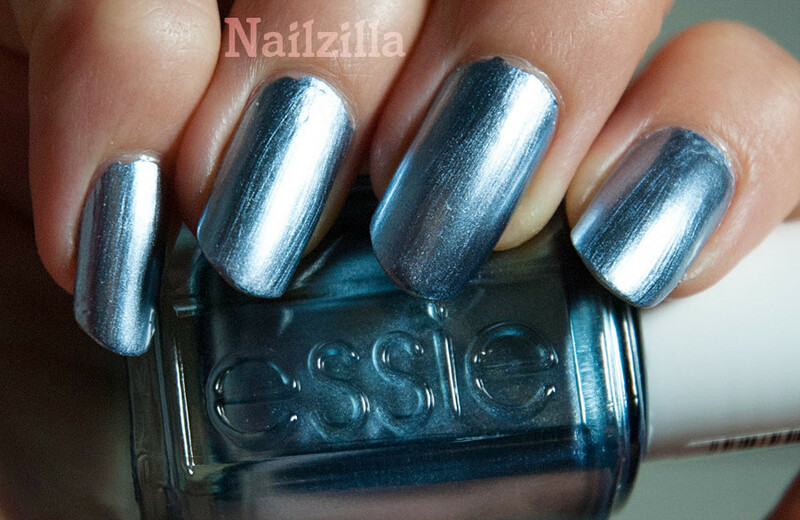 I finally found some Essie metallics and grabbed my favorite of the bunch - an icy metal blue, called Blue Rhapsody. It's a bit brushstrokey, but that makes it so reflective and with a steady hand, it didn't look too bad. I LOVED this color. It was a 2-coater (1 will fill and 2nd will cover the bald spots) and it dried very fast. The formula is creamy and glides on, but if you go over wet polish with a brush, it can create bald spots. The best part is how shiny it was. Somehow, I like it better than plain silver because it appears even more metallic and less dull in my opinion. The blue looks great on my skintone, which I was surprised by. This is my favourite metallic polish I own so far, even though it shows brush strokes. Also, these photos are some of the best nail photos I took so far. This is an awesome milestone, compared to a year ago. Hurray to improvements! This blue does look great on you! Its such and icy color! Thanks! Yes, it is quite striking! I really like this colour on you, too! Also... welcome back! I really meant to post that when you were actually just back, but I procrastinated and now it's really belated, heh. Thank you so much! I really appreciate your comment - no worries, procrastination... is fun haha.